Bobby Rox a local Washington, D.C. DJ recently released an interview he did with legendary radio personality Donnie Simpson. The interview captured more than a year ago took place at Ben's Next Door, a restaurant located adjacent to the famous D.C. eatery, Ben's Chili Bowl. Donnie talked about his radio career and the changes that have taken place over the years in the radio industry. Donnie got his start in radio at the age of 15, in his native city of Detroit at WJLB. In D.C. he worked at WRC-FM, WKYS, and WPGC along with anchoring the sports reports on the weekends for a time at the NBC affiliate WRC-TV Channel 4. He gained national notoriety as the host of Video Soul which aired on the BET cable channel for 15 years. 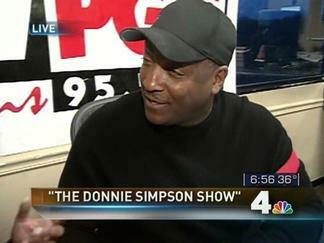 Donnie Simpson has been off the air since 2010 when he lasted hosted mornings at WPGC. The Bobby Rox radio show can be heard at www.rocktheflow.com or 89.3 FM in DC. He also mixes on the FOX 5 Morning News.